For the next game in my Games of the Decade (the noughties, that is) series there’s not all that much that I can think of to say because, to be honest, it’s a game famed for its simplicity. 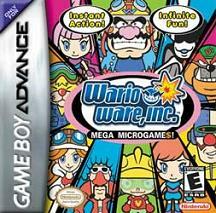 It’s Wario Ware for the Gameboy Advance. Let’s cut straight to the chase: Wario Ware is essentially dozens and dozens of extremely-simple minigames. The “plot”, if you can call it that, is that Wario (Mario’s evil nemesis type person thing) has set-up a software house to publish games and the games you get on the cart are Wario Ware’s output. The games themselves are gathered into “themes” based around different characters (who each have their own excellent little intro animation) and are played rapidy and at random. The player is given no instructions and almost-always has to work out how to play the games themselves which is easier than it sounds. The games have various genres from shooters to racing games to simple puzzles. No game is played for much longer than a few seconds and if the player “wins” they get a point, if they “lose” they lose a life. If you score enough points in a level then you can take on a “boss game” for an extra life. It only ends when you run out of lives but to keep things interesting the games get faster, harder and are played for less time as things progress. Get enough points and you can unlock more gaming themes and characters and the option is always open to return to previous characters and attempt to beat your high score. There are also other extra games (“full games” based around Doctor Mario and the like) which can be unlocked by completing other tasks which the player can discover by themselves. Wario Ware works for two reasons. The first is that it’s gaming at its most simple: plotting, complex controls and byzantine scoring systems simply don’t exist here and given that this game was released when console games were aspiring to become some sort of “true” artform and beginning to forget they were games at all this was a breath of fresh air. The second reason is that Wario Ware has tremendous personality, in fact it’s one of those games which could actually be described as charismatic. The games have tremendous graphics, amusing and charming sound effects and a terrific sense of humour: if you play this game it’s almost a certainty that several of the games will make you laugh out loud on your first play. Playing Wario Ware is basically a joy. If you have a Gameboy Advance or a Nintendo DS then you really ought to own this game or one of its many sequels. You owe your console that, at least.